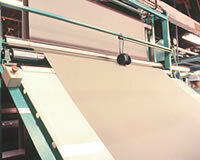 We continue to make progress as a nonwoven and felt manufacturer through our own advanced manufacturing techniques. Our manufacturing team strives to make the manufacturing process as efficient as possible. We maintain 100% control of product quality and develop original equipment to use in the production of high quality nonwoven and felt products. Copyright © FUJI Corporation. All Rights Reserved.